Many tidally-driven aquatic habitats in coastal Massachusetts have been partially restricted or completely obstructed as a result of human development and infrastructure. Aquatic connectivity between freshwater, estuarine, and marine habitats is important for the movement and survival of many migratory organisms. Diadromous fish such as Atlantic salmon, alewife, shad, and American eels, for example, require access to freshwater habitats to complete their life cycle and spawn. Other wildlife species, such as northern diamond-backed terrapins and migratory birds such as waterfowl live and feed in both freshwater and salt water. Many stressors projected to increase under climate change such as increased temperatures, changes in hydrology, and sea level rise, exacerbate existing stressors from human activities 6,10. Specifically, dams, culverts, and other tidal restrictions limit the distribution of aquatic species, making it difficult for them to move and adapt to shifting environmental conditions. With anticipated changes in the timing, magnitude, and duration of stream flows due to increasing climate impacts, tidal restrictions should be identified and assessed for their potential short-term and long-term effects on migratory fish and other wildlife species 11. While many tidal restrictions are obvious (tidal gates), others may be more difficult to identify. Locating and identifying environmental conditions and attributes of tidal restrictions is essential for informing future adaptation and restoration strategies in the face of climate change. Tidal Atlases have been created in Massachusetts, which have identified tidal restrictions in many locations. Before conducting an assessment, look for existing assessments that have already been conducted in your watershed. Connectivity between freshwater and marine aquatic habitats is essential for the migration of coastal habitats and species. Salt marshes as well as beaches and dunes are important for protecting inland habitats against storms, waves, and sea water. As sea level rises, many low-lying coastal habitats will persist through inland movements but require the space to do so 8,9; however, in many instances, coastal habitat migration will be restricted by barriers from human infrastructure and development. Understanding how salt marshes and other coastal habitats will respond to climate change is important for coastal adaptation and future planning of infrastructure and land designation. For example, if it were determined that a plot of land would be inundated by sea water in 10 years, land use decisions would be impacted. Many tools are available for assessing future inundation scenarios with climate change. Assessment tools such as sea level rise models, barrier inventory, and elevation change models are available to assess salt marsh migrations. When combined, these frameworks can help highlight obstructions and the appropriate metrics and methods for restoration, conservation, and climate change adaptation. Dams are significant barriers to aquatic organisms in coastal Massachusetts. When tidal barriers are removed or culverts widened, a range of species including fish, crustaceans, and plants have responded positively to increased connectivity and access to upstream and downstream habitats 2,3,4,5. The removal of aquatic barriers in tidal rivers and coastal areas is often the most beneficial action to fish and wildlife resources, but not always possible. There are a number of resources for identifying and prioritizing aquatic obstruction removal. Massachusetts Division of Ecological Restoration (DER) actively assists organizations and agencies by providing technical information regarding river and stream restoration. See DER’s Dam Removal Resources page for more information. For additional information about river restoration, consult Massachusetts Climate Action Tool pages for dams and culverts. Many Geographic Information System (GIS) services are available to inform dam removal sites, such as The Nature Conservancy and Southampton University’s Barrier Analysis tool. For more information, see the Northeast Aquatic Connectivity study. Gathering information early during assessments of tidal restrictions is important for the most accurate and relevant data to inform decisions. Engagement with partner groups and organizations is important to ensure time for preparation, collaboration and related project processes. Outreach and collaboration with many partners will likely increase the odds of restoration project success. Outreach and education of the local public of the need and benefits of the project will also increase the likelihood of local restoration project support and success. As sea levels continue to rise, aquatic pathways may change, and the degree of obstruction of certain barriers may be altered. In addition, land use planning may be impacted by inundation of new landscapes. Careful planning and consideration of obstruction attributes as well as site- and watershed-level physical and environmental conditions will enhance future conservation, planning, and river restoration projects. Many aquatic organisms live in tidally driven estuarine habitat, such as forage fish, coastal fish, and crabs. Access to freshwater and marine habitats through estuaries is particularly important for local forage fish. For example, mummichogs and killifish live and move throughout estuaries, while some migratory forage fish, such as anadromous river herring, rely on flowing water to access spawning grounds located in upstream or inland freshwater streams and ponds. Aquatic obstructions alter or reduce the flow of water. Maintaining natural flow regimes is ideal, particularly in coastal streams and rivers that are gateways to freshwater aquatic habitats. If culverts are too small, water velocities may increase and prevent passage of native fish 7. Restoration for multiple species that require different kinds of flows can create challenges; however, opportunities may be available to use existing barriers to manage flow conditions, allowing them to stay in place and altered rather than completely replaced. A range of assessment tools, environmental data and map services exist including Lidar, Satellite images, GIS, tide gauge and temperature data. Streamflow data in Massachusetts is available through USGS and NOAA. 1. Barrett, S.B., B.C. Graves, and B. Blumeris. 2006. The Mount Hope Bay Tidal Restriction Atlas: Identifying Man-made Structures which Potentially Degrade Coastal Habitats in Mount Hope Bay, Massachusetts. Northeast Naturalist 13: 31-46. 2. Bowron, T., N. Neatt, D. van Proosdij, J. Lundholm, and J. Graham. 2011. Macro-Tidal Salt Marsh Ecosystem Response to Culvert Expansion. Restoration Ecology 19:307-322. 3. Boys, C.A., and R.J. Williams. 2012. Succession of fish and crustacean assemblages following reinstatement of tidal flow in a temperate coastal ecosystem. 2012. Ecological Engineering 49: 221-232. 4. Boys, C.A., F.J. Kroon, T.M. Glasby, and. K. Wilkinson. 2012. Improved fish and crustacean passage in tidal creeks following floodgate remediation. Journal of Applied Ecology 49:223-233. 5. Buchsbaum, R.N., J. Catena, E. Hutchins, and M.J. James-Pirra. 2006. 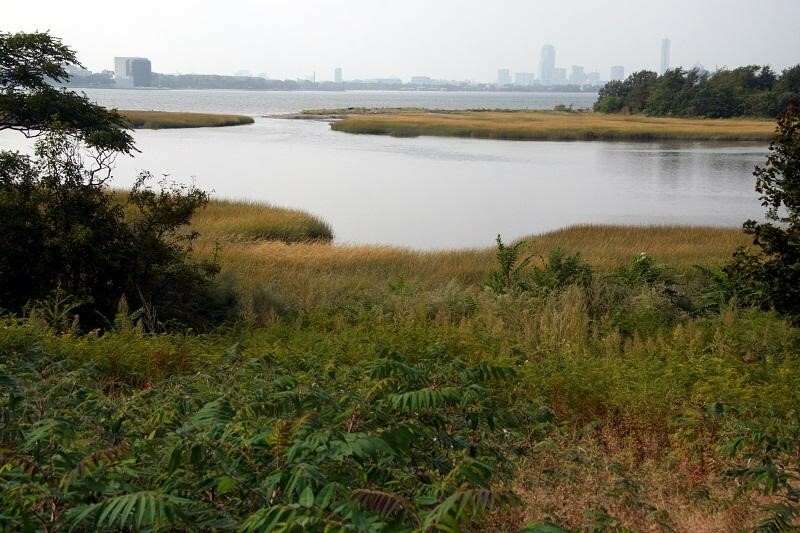 Changes in Salt Marsh Vegetation, Phragmites Australis, and Nekton in Response to Increased Tidal Flushing in a New England Salt Marsh. Wetlands 26:544-557.
in policy and management when existing biodiversity stressors interact with climate change. 7. Eberhardt, A.L., D.M. Burdick, and M. Dionne. 2011. The Effects of Road Culverts on Nekton in New England Salt Marshes: Implications for Tidal Restoration. Restoration Ecology 19:776-785. 8. Goodman, J.E., M.E. Wood, and W.R. Gehrels. 2007. A 17-yr record of sediment accretion in the salt marshes of Maine (USA). Marine Geology. Volume 242: 109-121. 9. Redfield, A.C., and M. Rubin. 1962. The age of salt marsh peat and its relation to recent changes in sea level at Barnstable, Massachusetts. PNAS 48:1728-1735.